After an initial brainstorming session about ‘Rome and how to go on…. ?’, in which we couldn’t stop talking about our experiences, encounters and new plans, I read in an e- mail the request of Vic Groetelaars, CM to write an impression about the symposium, “Welcome the Stranger” that we recently attended in Rome. Not easy. How can I inform you in a few paragraphs about the content and the impact of such a grand and global Vincentian event embedded in a tradition of which most of you are involved in for a much longer time and know much more about it than I do? Nevertheless, I’ll try to do it. I would like to start by telling you something about my first acquaintances with Vincent. After that, I will take up some of the elements of the symposium that affected me personally. Maybe the beginning of my involvement with the Vincentian Movement lies in the movie ‘Monsieur Vincent,’ which in the meantime I have seen at least six times. A French film from 1948, so just after the Second World War. Even though somewhat dated for our time in terms of image and sound, it is an impressive film that certainly can stand the test of time. At least for me. Every time I am touched by a different scene. For example, one of the last scenes of the film in which a toddler, stumbling amidst the rubble and smoke, is leaving the battlefield of a war. In that image of this lonely toddler in that desolate landscape, I was moved by the thought that, after the horrors of the Second World War, France once again needed a symbol of hope, courage and strength. And for that symbol they chose Vincent de Paul. Vincent, an ancestor, a compatriot, one who could inspire a tired, wounded and disillusioned people with a renewed perspective. 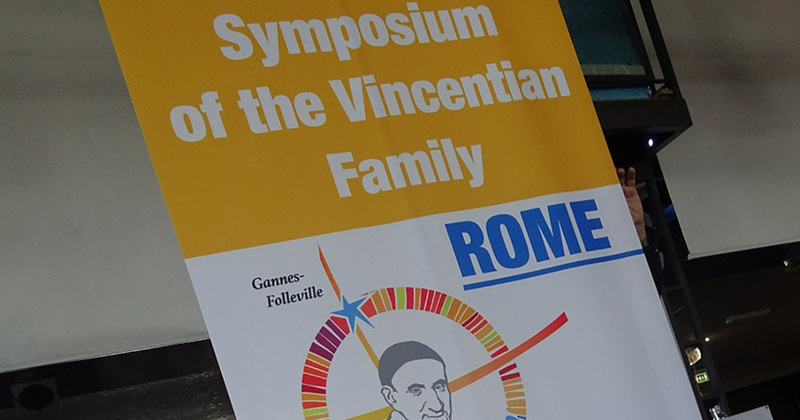 The worldwide symposium in Rome is a tribute to Vincent de Paul who started his mission of charity 400 years ago. During a working visit to Mexico in 2016, Pope Francis called these two projects ‘prophetic courage’ and ‘social commitment.’ After years of wandering and searching followed by two decisive experiences in 1617, Vincent organizes from a fresh fountain of inspiration, many new social projects to make the world a bit more just, more social and more beautiful. And many generations after him do the same. Now there is a worldwide Vincentian Family of 200 different branches in 150 countries with a total of some 2 million members working for disadvantaged people. At the Leonianum, the CM house in the Via Pompeo Magno, the 9,500 participants from 99 countries register for the symposium. Likewise, the six of us from CM and Vincent de Paul Center in the Netherlands. At the front door young people are welcoming us, we get the materials for the symposium in linen bags and a friendly woman walks along with me to show where the synthesizers’ deliberations will take place. It is a cozy, cheerful crowd. In passing we say hello to Joe Agostino, CM, the great organizer of the symposium, whom we met extensively during his working visit to the Netherlands exactly one year ago. The symposium takes place at PalaCavicchi, a conference building just outside Rome. There, three of the six language groups come together, including the English one in which we participate. We are not only enthusiastic participants, we are also there with a task: Tjeu van Knippenberg CM and Peter Reijers are invited to give a presentation, Hetty Nieuwaard and Annette Reijers are volunteer staff members and Harrie Jaspers CM is our enthusiastic supporter, helper and stay. I was asked to be a synthesizer of the symposium. That is – as I found out – someone who is ‘the eyes and ears’ of the symposium: listening, picking up signals from what is going on, making one’s own report and then composing it with the other synthesizers into a joint report. A task, I took up with love and diligence. The symposium consists of several parts. Undoubtedly there will be a report or a letter of progress, so for now I will give an impression of three parts of the symposium that have affected me personally. How do you bring the parable of a common house closer where people can live in peace? An earth where people do not die of hunger but where there is food for all. An earth where people are not threatened by drought or war, but where there is security for everyone. A world where people are not excluded from education and work, but where everyone has opportunities to make something of life. How do you do that? How do you bridge distances and differences, how do you overcome fear and indifference, in what way can you connect what is separated but belongs together: poor-rich, young-old, north-south? In the biography of Vincent de Paul by Louis Cognet I found a short description of Vincent’s first missions. Moved by the desperate and unjust poverty of people in rural areas, Vincent started his first mission to Folleville in 1617 and after returning from Châtillon-les-Dombes, in 1618 to Villepreux. Vincent applied the same method everywhere. Three steps. First, to inform people about important Christian values. Cognet does not mention which ones, but I can imagine that Vincent and his companions spoke of faith and justice, of love and forgiveness and of liberation and vocation. He then invited people to a general confession, an action that purifies one’s entire life and that at the same time hopes to liberate people from the sometimes great spiritual confusion and distress caused by a life in suffocating and oppressive structures. The third step is to establish a charity in which people work together for assistance and pastoral care wherever necessary. For me, this three-stage process of Vincent is the core content of the presentation by Tjeu and Peter. In contemporary language they call it: evangelizing, liberating and serving. Since 1617 unabatedly relevant. This three-stage process can bring you closer to a common house: only by becoming aware, can you learn to discover where your liberation lies and once you are liberated, you want to cooperate in building a better world. Vincent gave us this insight with his first popular missions. Where do we want to go with the Vincentian Movement and how do we get there? As a Vincentian global movement, how can we make a meaningful contribution to solving major social issues of our time such as poverty, war and economic greed? Dennis Holtschneider, CM, former president of DePaul University in Chicago and now the leader of the largest Catholic health care federation in the United States, reflects on and elaborates in his presentation these questions. His answer is as simple as it is complex: to collaborate more, better and smarter. We should not lock ourselves up in rigid organizations but we want to be a living movement. Vincent did not rigidly adhere to general principles either, but he was able to move also with great flexibility, as required by the work. An example. Initially, Vincent preferred to see his priests working as itinerant missionaries rather than work in stable parish ministry. The work of spiritual formation and social education was an intensive process. After each mission, the priests were ‘free’ to study and to prepare themselves for the next mission. Later, however, Vincent saw that the work for older travelling missionary priests was heavy and that they could be of better use in the service of the more regular parish work. Thus he changed course. The adage: be flexible, deal with situations as circumstances demand, dare to move on. ‘Together’ and ‘connecting’ are key words. Vincent had that special talent. He was able to connect people from all kinds of backgrounds: old and young, religious and lay people, volunteers and civil servants, historians and politicians. He also managed to develop new forms of work and organization, such as the ‘Petite Méthode’ and the ‘Charités’. And he constantly kept a sharp eye on the people for whom he ultimately did it all: the poor, the underprivileged of his time. He was able to inspire the hearts of all kinds of people to actively commit themselves to the poverty issues of their time. The same goes for Dennis Holtschneider’s call: develop partnership projects, where you can work together with others on the great social objectives of our time, learn along the way and tell each other the stories of your successes and failures, of your experiences and your learning moments. In short, work together, learn from each other, create a culture of Vincentian story telling. The meeting with Pope Francis is on Saturday. Already early on, under dazzling sunshine, we are standing on top of the stairs of St. Peter’s Square. It will take hours before the Pope will arrive, but with a programme of spirited stories, invigorating music and interesting encounters it is quickly 12 noon. A lively and expectant atmosphere hovers over the square with its thousands of people, when Pope Francis drives onto the square where everyone wears their yellow Vincent scarf around their neck, in their hair, on their wrist or as a flag in their hand. In his word of welcome to Pope Francis, Superior General Tomaž Mavrič speaks about the ambitions of the Vincentian Family: ‘to globalize charity until it reaches the farthest corners of the world.’ He presents two new global initiatives: an initiative to combat all kinds of homelessness and a film festival. In his reaction, the Pope expressed his gratitude for the Vincentian charism. He summarizes it in three steps: cultivate your inner self by silence and prayer, make room in yourself for others and then move out into the world and serve. When he leaves, St. Peter’s Square is for a few moments one large inspired family. Once back in the Netherlands I realize how much work there is to do. Poverty, refugees, climate change. Again I have to think of the film ‘Monsieur Vincent’. And once more to one of the last scenes in which Vincent speaks with former Queen Anne of Austria, just before his death. She asks Vincent how he looks back on his life. I would have loved to do more, much more, says Vincent. ‘Davantage.’ I understand.